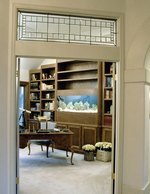 Oysters, and all bivalves, are notoriously difficult to keep in a home aquarium. They require pristine water conditions and copious feedings to thrive. These are best limited to one or two in a fish or reef aquarium. An oyster-only tank is a better option, as most aquarium fish cannot tolerate the high flow and amount of food necessary in oyster keeping. Spiny oysters are the most commonly kept in home aquariums. 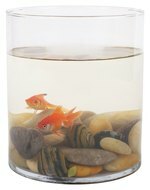 Set up a 20 gallon or larger tank with saltwater with an undergravel filter bed and a mechanical filter (hang-on-back or canister) Provide an aerator and a pump designed for high water flow. A 20-gallon tank can house approximately 15 oysters. Add a substrate of crushed coral, crushed oyster shells or dolomite. Cycle the tank by running it with no lifeforms for up to three weeks to build up nitrifying bacteria. Add oysters slowly, a few at a time. Wait a week before adding more. Feed your oysters daily. Turn off your filtration during feeding. Feed an invertebrate diet for filter feedings, occasionally combined with a fatty-rich, microalgae-filled liquid food offered on the market as a larval food. Feed each oyster individually with a pipette or syringe (needle removed) upstream of the oyster.